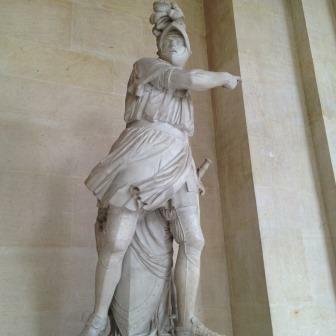 ARE THE TOILETS THIS WAY??? 1. AVOID GOING TUESDAYS. Versailles is shut on Mondays so any tourists who couldn’t go Monday flock there the next day. 2. Pre-buy your tickets online first of all. This presumes you know what day you are going in advance. Then go queue to get into the Chateau marked as A on the map below. But if you have no ENTRY ticket you have to queue first in the other line on the left of this to buy your tickets from the BILLETRIE. If you have not pre-booked your entry tickets online, then when buying your tickets there, the faster lane is the automatic machines inside the Billeterie (left hand side of map below). They are easy to use. 4. Buy up big for a gourmet picnic and then taxi or walk to the Chateau from here. 5. Wander and picnic round the enormous grounds of Versailles gardens (free entry round the side past the queues and there are toilets and cafes hidden in the mazes in the grounds to enjoy) and then stroll back to the Palace entry when the line of tourists into the chateau has lessened after lunch sometime. As I said earlier, avoid Tuesdays and weekends (unless you want to see the fountains display only on at weekends) when there is a crowd. You can also consult the calendar of the castle to see the tourist crowds forecasted. A forewarning, all of these options, except the bus, require you to finish the journey on foot (between 10 to 20 minutes walk from the station). 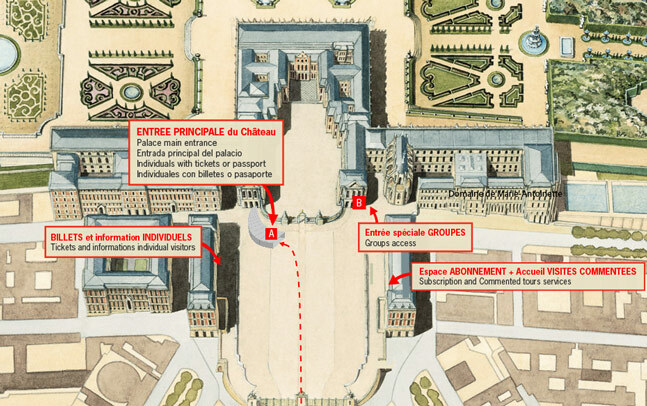 There is also a shuttle, Versailles Express, which goes directly to the Palace of Versailles. The shuttle departs from Quai Bourdonnais, near the Eiffel Tower. TAKING THE TRAIN TO VERSAILLES FROM PARIS You take the RER C line from several metro stations in Paris (eg: St Michel-Notre Dame, Musee d’Orsay, Invalides, Pont de L’Alma, Champ de Mars.) See a metro map here. The Yellow Line stations go out to RER C in the bottom left of the picture. stroll or bike-ride (hire them in the grounds) the superb Chateau grounds and imagine your are Kirsten Dunst the night after that famous Versailles party. Bring a bottle of champagne and have a picnic on the Grand Canal. Then visit Les Trianons where Louis went to escape from his courtiers and play with his clocks. For history of Versailles Palace click here. Finally – on weekends; a good time to enter the chateau and look through it is often around 3 pm as many of the tourists have wandered outside to watch the fountains display. I also recommend you by-pass King Louis’s private Chapel on the first floor as the crowds clustering round the doorway are appalling. You get to see the chapel more easily from the floor above with less people.